First of its kind planned for midtown Atlanta. Tulsa, Oklahoma-based QuikTrip plans to open a new location on Peachtree Street in midtown Atlanta. 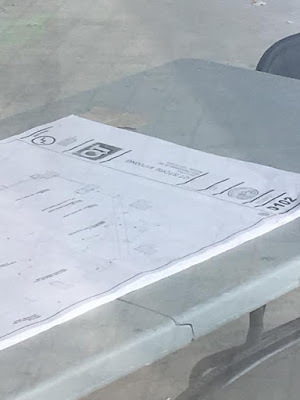 Unlike any of its other metro locations where both gas and convenience store items are available, this location will be a convenience store (C-Store) only. The new QuikTrip will occupy just over 3,500 square feet in the street level retail space of the Viewpoint condo building. The space, located at the corner of Peachtree and 6th Streets was previously home to a Sprint store. According to Mike Thornbrugh, manager public / government affairs for QuikTrip, the store will be the first for the company in nearly 30 years. QuikTrip reportedly tested a similar concept in Tulsa nearly three decades ago but never expanded the test. Today, with more and more people moving back to intown markets, QuikTrip is hoping to find success in non-traditional locations within intown cores. The new store will be slightly more than half the size of a typical "Gen 3" QuikTrip location where the company has doubled down on their food and beverage offerings. Atlanta-area Gen 3 locations include those on Buford Highway in Doraville, Clairmont & Briarcliff Roads nears Sagamore Hills and Chamblee Tucker Road in Chamblee. 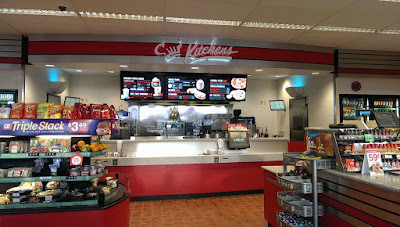 Gen 3 QuikTrip locations offer fresh made-to-order items, prepared foods (many made locally at the company's commissary in Ellenwood) assorted canned and bottled beverages, gourmet beverages such as premium coffees and milkshakes, as well as the typical assortment of convenience store items. The premium food and beverage offerings are offered via the company's "QT Kitchens" counter, considered a mini restaurant by some . With a lease signed and construction underway, plans call for the location to open "late spring," perhaps as soon as late May or early June. There is an existing CVS Pharmacy across the street from the upcoming QT and a Starbucks nearby. Starbucks Coffee, currently located in the street level of Viewpoint, will soon move to a newly constructed space in the Seventh Midtown property, at the corner of Peachtree & 7th Streets. The Starbucks was previously located in a freestanding building where the new condo building now sits. The nine-story condo building includes just 20 "spacious residences." The Starbucks location will be branded "Starbucks Reserve," and is expected to open April 24th. The new location will feature the Clover Press and Black Eagle coffee machines, assorted baked goods and will provide a more "upscale" experience than its predecessor(s). The new QT would seem to be well positioned for success given the company's C-store experience and value offerings. With the Starbucks going more "up market" and CVS, while smaller than a Kroger, still larger than a convenience store, QT may be able to capture a significant number of busy midtown consumers. Although run very differently than QuikTrip, Dallas, Texas-based 7-Eleven is the world leader in C-stores, yet (currently) has zero presence in Georgia, according to its website. "7‑Eleven is the world’s largest convenience store chain operating, franchising and licensing stores in 18 countries." It's no secret that the revenue brought in from the sale of gas is often marginal to gas station operators: the real money is generally in the convenience store items offered inside the store. With this in mind, I would not be surprised to see QT test this concept in other markets if proven successful although there are no currently no immediate plans to do so. What are your thoughts on this midtown development? Are you excited to see a QT opening in such a unique location? What products would you purchase most often from QT? As a resident and owner at Viewpoint this really disappoints me. This is not going to help the image in this area of Midtown and isn't what I'm hearing folks want. Ugh. I think it's FANTASTIC and a great alternative to a trip to the Publix a few blocks over. I own in the building across the street, and this is absolutely some of the worst neighborhood development news I've heard in a while. This is a prime example of what any urban city does not need... a big brand convenience store. I am disgusted with this news and will loathe having to walk past it day by day knowing that if it had been something different, it would have possibly contributed to property value. UGH. What's next? Subway opening a gas station? Ladies and gentlemen of Midtown, fear not. This is excellent news. If you're upset about this, you haven't been to a QT. These are not your typical convenience store experience. They are clean, well organized, and are staffed with people that are held to high standards of customer service. As my friend pointed out, they're the Chick-fil-A of convenience stores (with a higher HRC rating). The urban quick service convenience store is an integral part of walk-able street life and I think you'll really like it once it opens. Certainly more productive than an empty space and will benefit existing and future retailers around it. It is sad that consistent/great service is THE most memorable and distinctive thing separating the CFAs/QTs of the world from others. Friendly service used to be the standard. Now it's the competitive edge. There might have been many less-thrilling things sign a lease in this space, trust me. I live across the street in Spire, and I am actually excited about this opening. It's these type of everyday 'conveniences' that make an area more livable... not yet another restaurant/nail salon/drycleaner/etc. Most major cities have these type of convenience stores every couple blocks... for a reason. I'm not sure how this would really hurt any image of midtown... it's not like it will be bringing people in, it will just be serving the locals who are already here. Quicktrip typically runs a decent, clean store so I have no issue with it. Have any of the haters been to an actual functioning city where people walk or take transit everywhere. It doesn't even need to be NYC or DC, which have convenient stores everywhere because...you know...they are part of a functioning city. Baltimore, areas in Chicago outside the loop, stops on the green line in Boston, center city in Philly. Convenience-type stores all over the place serving the density we hope to achieve, right? You don't get to master plan city centers folks. Businesses open who perceive an opportunity to make money so we get the businesses that we can support. The other random clothing stores and sub par bars close up and leave empty store fronts. So when you bought your unit was the sprint/clear store a huge selling point? 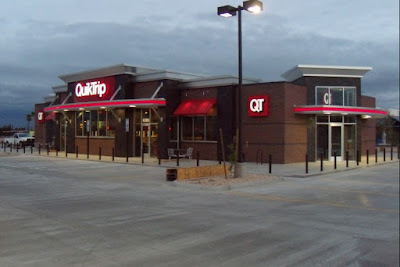 if they opened the exact same store as what QT is opening, but instead called it something else with a more pretentious name, you dumbass haters would all love it. they are not opening a gas station, people! it's a store and it's exactly the kind of thing we need to breathe even more life into our neighborhood. the haters are ridiculous. I was in San Francisco a while back and went into some Walgreen's convenience store that knocked my socks off. This was in their Union Square area (I think it was the one at 135 Powell st), but granted that area is no midtown. This will be kind of like that. Inexpensive but decent quality cold/frozen drinks, hot drinks, ice cream, sandwiches, etc. Maybe with some feedback, QT can make it similar to that Walgreens (which had a smoothie area, sushi). This is my neighborhood. Will they have the SLUSHIE MACHINES that every QT has? Then I'll allow it. If you are gonna have any density, you'll need store fronts where you can get milk, paper towels, and band-aids at 1030pm. Is this going to be a 24/7 location like a regular QT? Maybe I overlooked it in the article. For all those south of 10th St. thinking this is bad...up here around 14th St we have zero options while you have a CVS, Publix, and Savi. Meanwhile, 80% of the storefront space on Ptree has been vacated, and all of the new spots on Juniper have never been filled (how many years now??). I hope they put the next one in 1010 or in the Campanile expansion. Or maybe the Trois/Article14 space! A 24-hour store (and a QT nonetheless) for this stretch of Peachtree is a huge win. As a Midtown resident that lives a couple blocks away, this is amazing news. It's great to have more options and it will definitely improve the city-like feeling we have in Midtown. Also, if I recall, CVS doesn't sell beer, so this may be a good local alternative to having to go to the liquor store. Wonder if they'll have growlers. While I'm sure QT would love to remain open 24 hours (as their normal locations do) this is something that will likely be tested / tweaked depending upon the traffic levels at the store. Additionally, it's likely that the city will have to approve the business staying open 24 hours, something it reportedly has yet to do. Thank you all for your comments and readership, I appreciate it. Most people seem to be in agreement with a few outliers - this is GOOD. This is what real cities have. Yes, they may not be called QT, but who cares? Would you be upset if it were 7-11? This is what is needed so you can buy a bag of chips at 11PM, a soda at 2PM, a sandwich at 8PM, and do it QUICK. Do you need a high end clothing store or furniture store? People talk about Chicago's Miracle Mile. First, Peachtree will NEVER be that. Second, the stores are chain stores with large square footage. The places on Peachtree are not big enough. All that will fit are smaller places - boutique stores, which don't make enough money to pay the rent. QT will do very well and you uppity folks in Viewpointe should feel lucky that you now have this great convenience. Bringing foot traffic to your property is GOOD. Empty store fronts is BAD. As a Viewpointer, I actually do not have a problem with it. I'd rather have this than a 7-11. QT will likely bring a lot of conveniences to the neighborhood and they tend to be clean. The area is missing this, the CVS is the closest we have to it now. I love pubs, but I'm glad they didn't give us our 10th pub in a 5 block area. First Tom's Ford dealership at Buckhead Atlanta won't change the oil on my Mustang (and tried to sell me a $490 keychain) and now QuikTrip won't sell me gas. Atlanta is losing its reputation as the best city for cars. I may have to move OTP. Exclusive? This is on almost every local website I've read this morning. My mistake. Please, in an effort to prevent such misleading headlines in the future, tell me from what other sites this news was reported. I'm guessing exclusive means they're trying to make sure they're the first ones to report it? - there's always been a back and forth between this site and What Not Atlanta (which seems to be filled with Colony Square ads now). There is a CVS across the street offering 90% of the items cited (band-aids, beer, TP, etc). It's already there. Something like a small grocery store, fresh market, etc would have been much better. I actually live in Tulsa, and share a property line with the fine folks at QT Corporate. They are a top notch organization for sure, and in my experience have always worked with residents to provide the best in a C-store experience. so when will charging stations be added? As long as there's Coke and cherry ICEEs I'm cool with it. Exclusive? This news has been floating around out there on the web for awhile now. Do your own Googling dude. This is a sign that there are actually enough people living there to need such things you find in traditional urban centers. Hopefully with all the high rises going up near West Peachtree and 14th we'll see a few more of this type of establishment. Please, do tell, where else prior to my post last night did you see this news? This is great. Coming from Tokyo and now living in Atlanta, I miss little conveniences like this. What possible difference could it make whether QT news is 'exclusive' or 'first' or whatever? I don't have a problem with the store itself, I always find QT's clean and the staff friendly (I love their coffee), but I do foresee problems with people loitering outside, asking for money, etc. Not mention more litter blowing down Peachtree Street. I wonder how they plan to address these type of issues, if at all. I also have to wonder if they are kind of thumbing their noses at the Midtown Neighborhood Associations successful campaign to keep them from building a full on gas station on Ponce, across from Krispy Kreme. I imagine QT's corporate bean-counters have baked-in the cost of uniformed security for these small footprint, high-density stores. @mindspringyahoo we're getting one of those fancy Walgreens! That's what's moving into the Olympia building in downtown. The first commenter cracked me up. I am JEALOUS; I wish there were a gas-pump-free convenience store that's the quality of a QT in my neighborhood (Reynoldstown). I'm old enough to remember when there were 7-11 locations in Atlanta before the company sold them off in the early 1980s. I also remember the old Magik Market chain of C-stores that were very prevalent in the Atlanta area into the early 90s. These were C-stores that generally lacked gas pumps, which was fairly common into the mid-to-late 1980s, as gas stations usually had garages or a very small selection of stuff like snacks and drinks. Atlanta is QT's top market, edging out Dallas-Fort Worth. 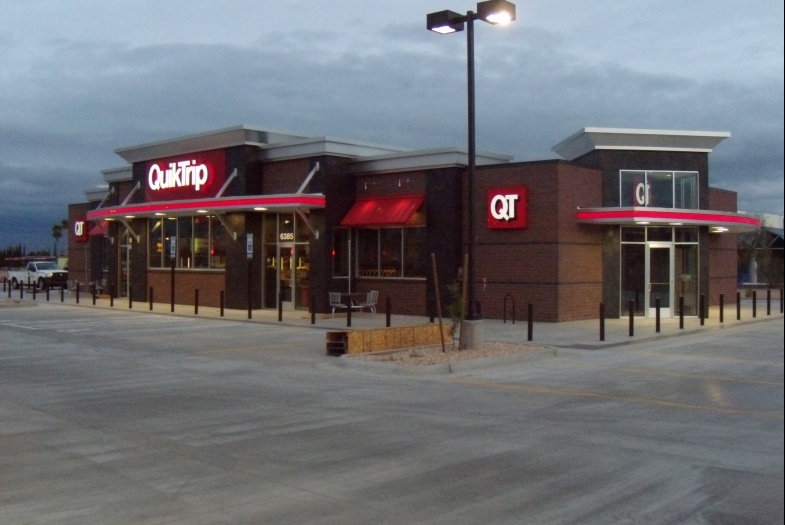 Both markets have QT and RaceTrac (whose newer stores definitely give QT some competition, but QT still excels). They're willing to test this concept here because they have such a large presence here (They do need to open up some locations west of Covington though, as a QT truck stop or two on I-20 between Atlanta and Augusta would do big business.). They just recently opened a new location here in Clayton County on Tara Blvd. that replaced the one on the corner of GA138 and 138 Spur. Finally something we are beating Dallas/Fort Worth in! Anyone remember Milk Jug (not kidding), the drive-up milk discounter? There were many around town. Their niche was to provide that gallon of milk for the family without the hassle of parking to enter a grocery. The existed before milk was offered with gasoline. They exited shortly after gas stations became c-stores. I worked at several gas stations during and after high school. At a Phillips 66 station on North Peachtree Rd.in about 1972, we started selling milk. We teen employees all though that was a most ridiculous idea. However customers liked the convenience. We later also offered charcoal and fluid for grills. For the record, a few years later I also though it was a silly idea for McD's to offer breakfast! Even further off topic here, sorry. Anonymous above, thanks for the comment about Milk Jug. There is a small block building down the street from me, and several of my older neighbors have call it "the Milk Jug". I always thought it was weird to have such a small place sell only milk, but I guess that's how they rolled back in the day. As for QuikTrip, I think this is a terrific idea. I hope it's very successful and that they expand it throughout the metro area. Anonymous near the Milk Jug...I'm guessing you live in Tucker since it's the only one operating now that I know of. We used to go to the one in Riverdale. I agree with you. Extremely dissapointing.